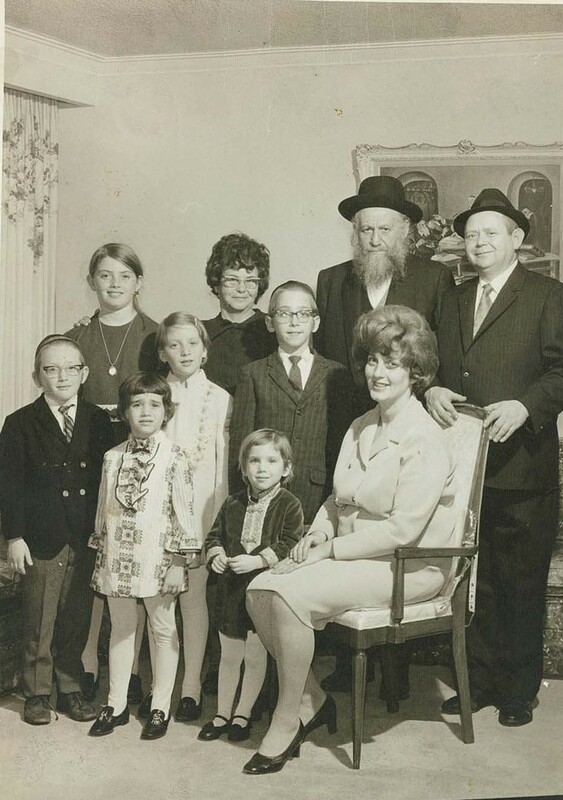 In 1956, my father met my mother, Esther Langner (who sadly passed away six years ago), the daughter of Rabbi Avraham Langner and the granddaughter of the illustrious Rav Moshe Langner, the Strettiner Rebbe. 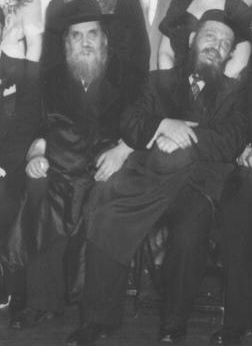 The Strettiner Rebbe of Toronto was the son of Grand Rabbi Yehudah Zvi Langner of Strettin, Poland, a widely known Chassidic Rabbi, whose followers settled in the Toronto area in the early 1900s. 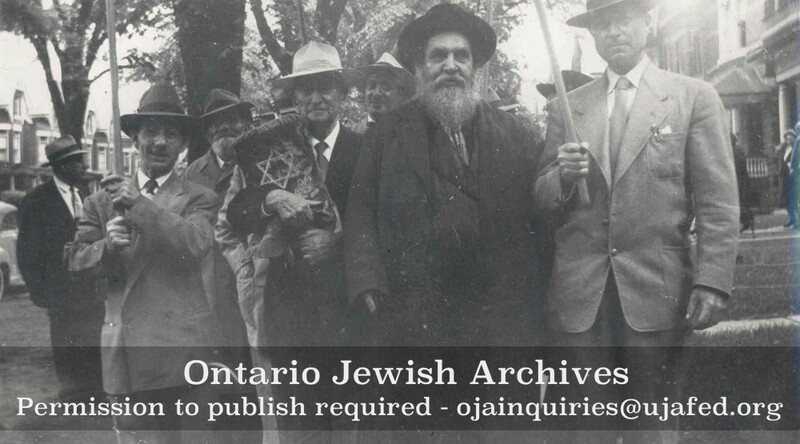 Rabbi Moshe Langner left Poland in 1921 to settle in Toronto among his adherents, and, upon his arrival, the Chevra Mishnais Synagogue was founded. He was the first Chassidic Rabbi to settle in Canada. 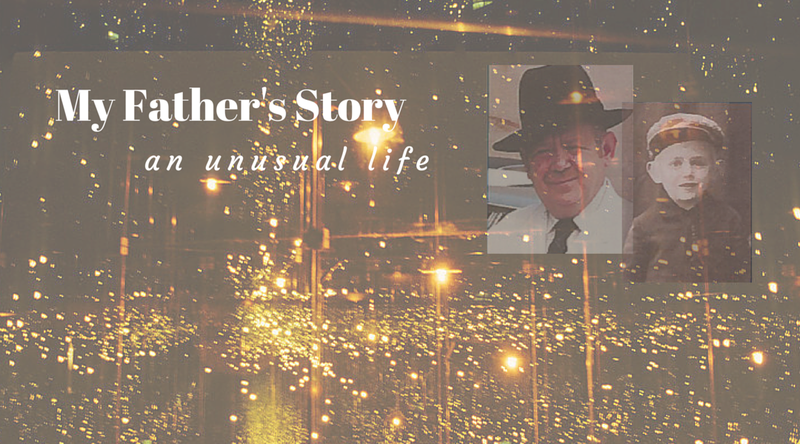 After a three-week courtship, my parents were married. My mother was an absolutely beautiful creature. 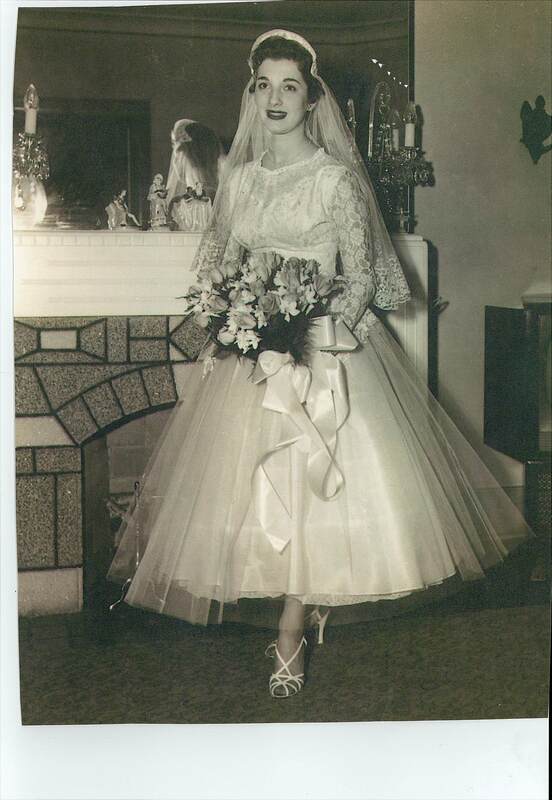 On December 19, 1956, nine months to the day of the marriage, Cheryl, the eldest was born. The next four children followed in short order; within five years, Benzion, Shaindy, Chaim, and I were born. Debbie, the youngest, was born 2 1/2 years later. He bought one retail store, and then expanded to three storefronts, occupying 3011, 3013 and 3015 Bathurst Streets. Eventually, 60 employees worked at Perl’s Meats. As the square footage expanded, so did the product line. “I had a good sense for what the public wanted and always strove to innovate and bring in new things,” he said once in an interview with the Canadian Jewish News. Perl’s began selling prepared foods in the late 1960s, with a two-item product line: knishes and kreplach, three dozen of the former and two dozen of the latter, per week. Soon afterward, he expanded to a wide variety of take out foods, which included salamis, hot dogs and deli. Eventually, Perl’s Meat and Deli became one of the major Canadian suppliers of kosher meat and deli products, and for years offered the largest ready-made take-out kosher food business in Canada. My father was very proud of what he accomplished, having come to Canada with barely nothing and building up a successful business with literally blood, sweat, and tears. It is not an understatement to say that the store was everything to him. 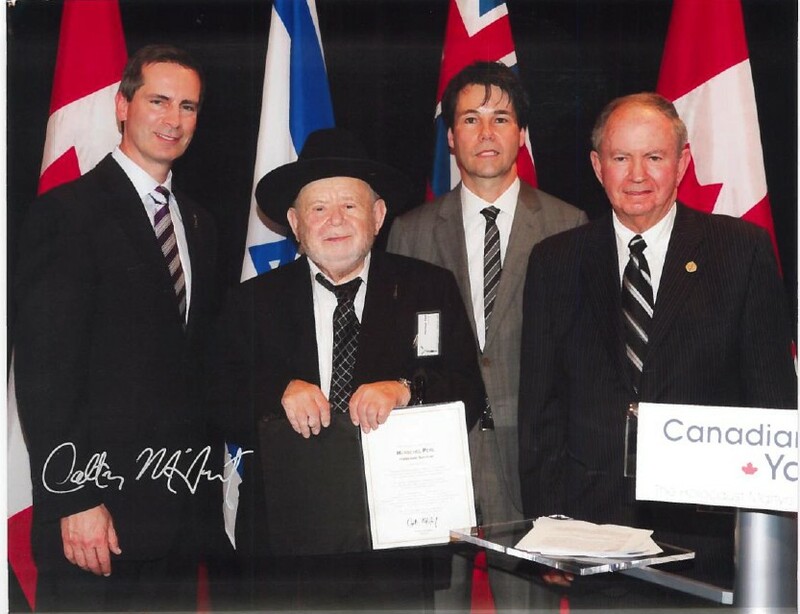 Many years later, on April 26, 2010, my father, along with 17 other Holocaust survivors, was honoured by then-premier of Ontario Dalton McGuinty at a ceremony held at Queen’s Park for their notable contributions to their community and to the province of Ontario. The ceremony, called “The Queen’s Park Tribute to Holocaust Survivors,” is an annual event organized by the Canadian Society for Yad Vashem in collaboration with the provincial government. My father, along with all of the honourees, was presented with a scroll of recognition for their contributions. It was a proud moment for him most of all, and the family was happy that he experienced a sense of gratification. Herman Perl at Queen’s Park Tribute with (left to right) former Ontario Premier Dalton McGuinty, Former Ontario Minister of Citizenship and Immigration Eric Hoskins and MPP Monte Kwinter. In reflecting on that day, there is one moment that sticks out in my mind. 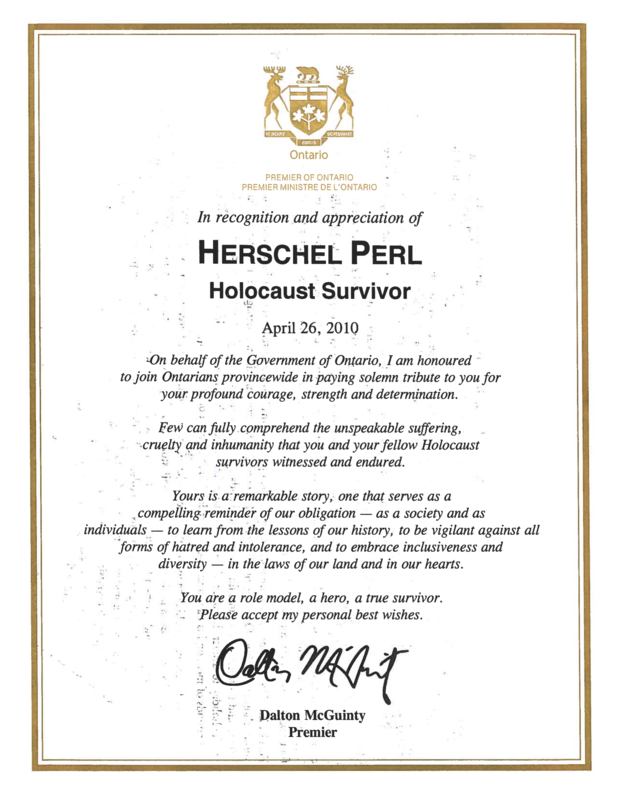 As each survivor approached the premier to receive the certificate, a brief version of the survivor’s bio was read by either Minister Eric Hoskins or MPP Monte Kwinter. In spite of the accolades, it was a somewhat bittersweet moment; just five months before the ceremony, tragedy had struck with incendiary force.